recommended for: Fans of Chuck Palahniuk. People looking for a well-written, tight story with gorgeous language. Anyone in need of a quick read. Seriously, just read it! George and Chloe are High School sweethearts nearing the end of their senior year with a serious problem. The adorable, inseparable couple that everyone sees smiling and holding hands is a façade. Behind George’s doting ways and charming smile lies a jealousy and paranoia so deep it drives him into a blind rage that is best kept under wraps. When Chloe announces she is moving to California for college George unravels and there is no stopping the rampaging, possessive beast that lives within causing him to do terrible, terrible things. Will George be able to take control of this inner monster before it destroys everything good in his life or will he be a slave to it just as his father was? 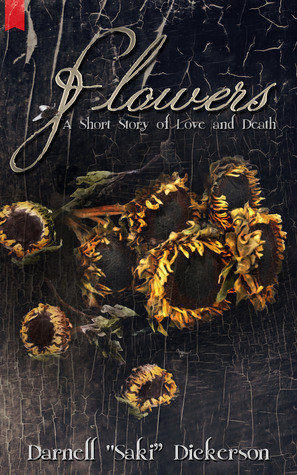 This is a story of young love and fear, affection and abuse, sunflowers and suspicion, innocence and blood. I'm very picky about short stories. Maybe it's all the fiction classes I took in college. Doesn't matter. Basically...I don't go around gushing about short stories lightly. So when I say that Flowers is a fantastic story, that's not an empty compliment. Set up as a journal, it gives us a slice into the life of George, a deeply troubled high school senior. We don't get his past. We don't get all the details, or know how we got here. That was one of my favorite parts. You're thrown into someone's life and you have to solve the puzzle. While I would have liked more details about George's father, and though the epilogue was unnecessary, on the whole I was extremely impressed. Dickerson knows how to create atmosphere and he has a literary voice both beautiful and captivatingly faltering. At least in George's character. I'm psyched for Dickerson's next work! I didn't exactly know where it was going from the beginning. It worked. I came to the realization slowly, which is perfect for a horror story. I watched the pieces forming into a puzzle, unable to stop it. I would have liked a little more set-up. I didn't need a full history of George's mom and dad, but considering how important they were, I would have liked more veiled references and hints. A few more journal entries, maybe. More hints of George's impulses before they're fully revealed. Mostly, I thought it moved at a great pace. I thought the last journal entry would have been a perfect ending. I really didn't need the epilogue, and I don't think it added anything. The comparison of flowers to women, especially as used here, is gorgeously sinister. Okay, it sounds pretty and normal. But just wait. I don't want to spoil it, but I'll just say...the concept of both of them withering is key to the message of this book, and so well done. It's the perfect frame for this length of story. Not too obvious, not too subtle. It gives me eerie tingles of literary joy thinking about it. I thought George was very well portrayed, but I wanted some more Chloe and more of George's mom and dad. I felt like I needed a better grasp on the parents, especially, to understand George and how he became who he is. However, George was, for the most part, very relatable. Even during the darkest parts of this story, I found myself wanting to hug and protect him. I'd be surprised if Dickerson hasn't taken some fiction classes. His writing is beautifully polished. There are a few confusing places, like on the first page--but considering it's a journal format, I felt like the confusing bits fit with George's state of mind. His language is simple for the most part, with forays into stronger language that's absolutely beautiful. As a result, it's a quick read that doesn't feel flowery (ha) or overbearing, but it creates a subtle, dark impression. Layer on layer. It's hard to describe, but you feel reading this book the way you do watching a horror movie, at the opening, when the character is first walking down that long dark hall but nothing horrid has happened yet. It's just beautiful. Okay . . . I am in love with this cover. I wish this was available as a physical copy because I want to be able to stare at this cover. Also, ya know, cause the story was very enjoyable! But seriously. The cover reminds me of my favorite Ivan Albright painting and it perfectly, beautifully, eerily matches the atmosphere of the story. Not to mention looks totally professional! Other mechanics-wise, there were some comma splices and such, but it was presented as a journal so I almost would have liked to see more weird grammar. An atmospheric horror story with a surprising plot and beautiful, clean writing.